IS THAT A BREAD BOX SPEEDING, WOW! Posted in Uncategorized | Comments Off on IS THAT A BREAD BOX SPEEDING, WOW! WHO KNEW THEY COULD GO SO FAST! It was almost startling just how fast a small car shaped like a loaf of bread was speeding through the Woodlands. It was a Scion. It had to be going at least 80mph in a 45 mph zone. I didn’t even know these cars could go that fast. 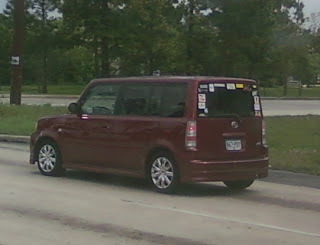 Frankly, I’m shocked because when I think of a Scion I always imagine a driver with a pocket protector pushing it at about 30mph. But that’s just me. By the way, slow down before you hurt someone! GIRL HIT AND KILLED BY THE SCHOOL BUS SHE WAS ON! Posted in Uncategorized | Comments Off on GIRL HIT AND KILLED BY THE SCHOOL BUS SHE WAS ON! WASHINGTON HIGH SCHOOL PRINCIPAL HONORED! Posted in Uncategorized | Comments Off on WASHINGTON HIGH SCHOOL PRINCIPAL HONORED! MARK BEDELL GETS THE AWARD! 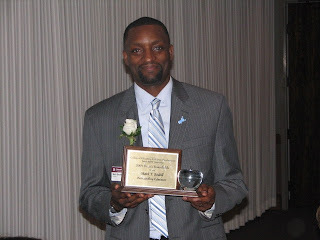 Booker T. Washington High School Principal Mark Bedell was honored April 24 as an “Outstanding Educator” by Texas A & M University. Bedell was honored for his service in the field of education by Kay and Jerry Cox at the Dean’s Roundtable hosted by the College of Education and Human Development at Texas A & M. Dean’s Roundtable members at Texas A & M recognize educators who have made a difference in the lives of students. Bedell believes that a mindset to empower others to reach their full potential is paramount in the field of education. Born to a 16-year old high school sophomore, he grew up in a drug-infested home with seven siblings and an abusive step father. Bedell was the only one among all his siblings to graduate from high school. He has worked for HISD for the past eight years, three as a teacher, four as an assistant principal and two as principal. He received teacher of the year honors in various categories two years in a row and also the feeder pattern principal of the year award this year. Bedell credits his love of basketball as a factor that motivated him to stay in school and keep up his grades. After becoming ineligible to play once, he told himself he would never let it happen again and began attending summer and night school, which resulted in his making the honor roll. He graduated from high school with a 3.12 GPA and was accepted at Fisk University. Bedell made the honor roll at Fisk and also lead the nation in scoring for Division III basketball. After meeting his wife Robyn at Fisk, he made the decision to focus on academics first and athletics second. Bedell graduated from Fisk with a degree in History and Education and accepted a job there as a basketball coach while continuing to work on his master’s in Educational Leadership from Tennessee State University. Bedell has presented at several national and state conferences on best practices in education and is currently writing his doctoral dissertation on drop out prevention for ethnic minority students from low economic strata. This topic is close to his heart as he has lived through and witnessed how students drop out when there is no one to advocate for them. WOULDN’T YOU KNOW IT: HOUSTON GETS THE FIRST U.S. SWINE FLU DEATH! Posted in Uncategorized | Comments Off on WOULDN’T YOU KNOW IT: HOUSTON GETS THE FIRST U.S. SWINE FLU DEATH! THE LATEST VICTIM OF A BABY FROM MEXICO! A young child has been confirmed as the first U.S. death from swine flu, and the first outside of Mexico. The 23-month-old, who is a native of Mexico, died in Houston, a city where no cases had been reported as they had been in other parts of the state. The case was confirmed amid increasing global anxiety over a health menace that has also swept Germany and Austria onto the roster of afflicted nations. Kathy Barton, Chief of the Office of Public Affairs for the Houston Department of Health and Human Services, says the child would not have posed a contagious risk to other people in the Houston area because the child had not traveled throughout the city. After arriving in Houston, the child was taken directly to ahospital, according to Barton. The HDHHS has not yet learned where in Mexico the child came from nor has it released the gender of the child. The child’s flu death in Texas was confirmed Wednesday by Dr. Richard Besser, acting director of the Centers for Disease Control and Prevention. In an interview with CNN, he gave no other details about the child. Germany confirmed three cases Wednesday and Austria confirmed one case. 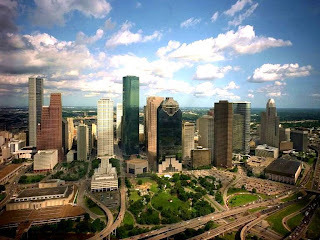 Posted in Uncategorized | Comments Off on THE MEMORIAL HERMANN PALACE! MAKING IT FANCY WITH MORE TO GO! I was riding along the Katy Freeway on Tuesday when a building caught my attention. It crawled into the sky and the top of the structure appeared to be a crown. It’s the expansion and new building for Memorial Hermann in Center City or the Town and Country area. I’m not quite sure what’s the name of that part of town off the Katy Freeway. Anyway, the building is large and elaborate with more new construction along side of it. It reminded me of something I saw while growing up in Louisiana and other places I’ve lived. No matter what the current economic climate is hospitals are always expanding. I guess the business of sick people never really hits a slump. No matter how poor or underpaid you get, we all still have to go to the hospital. It seems Memorial sunk a lot of cash into this fancy structure. Have you seen it and what do you think? MIKE JONES FREE CONCERT AND MEET AND GREET FOR THE FANS! Posted in Uncategorized | Comments Off on MIKE JONES FREE CONCERT AND MEET AND GREET FOR THE FANS! IT’S VENTURE WITH THE CELL PHONE COMPANY CRICKET! Cricket Communications, Inc., a leading provider of unlimited wireless services, is offering Houstonians free tickets to attend a Mike Jones concert on Monday, May 11 at Arena Theatre at 8 p.m. with doors opening at 7 p.m. To receive a pair of tickets, all Cricket customers must do is visit a Cricket store and show proof of downloading the Mike Jones’ “Next to You” ringback tone from his most recent CD that dropped Tuesday, April 28. Additionally, for those who can’t make it to the concert, Cricket will host three free meet and greet sessions with the rapper on April 29 at Airline Center (4487 North Freeway) from 4 – 6 p.m., May 11 at 3636 Old Spanish Trail from 4 – 6 p.m. and May 18 at Williamstown (9511 D Southwest Freeway) from 4 – 6 p.m. Since the Houston-grown rapper made his national debut in 2005 with a platinum grill and an infectious call-and-response slogan (‘Who? Mike Jones!’), Mike Jones’ freshman album Who is Mike Jones? has sold over 1.5 million copies. 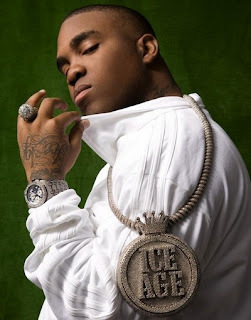 But before he had made it nationally, Jones started his own independent record label, Ice Age Entertainment, with money he had saved to pay for beats and studio time. His entrepreneurial drive and talent as he promoted his music on the streets, to DJs and at clubs, brought him to a deal with local hit-making label Swishahouse leading to his current success. Now four years later, Jones’ sophomore album The Voice was awaited by fans with anticipation and already had three hit singles before the album’s release (April 28). “Research shows that music plays a major role in the lives of our customers, and Cricket is pleased to partner with Mike Jones to provide this unique opportunity for our customers,” said Doug Ahrens, Regional General Manager of Cricket Communications. WHAT SHOULD HOUSTON DO TO STOP ALL THE FLOODING? Posted in Uncategorized | Comments Off on WHAT SHOULD HOUSTON DO TO STOP ALL THE FLOODING? IS IT A PROBLEM THAT WILL BE ADDRESSED IN OUR TIME? Here are some photos I took of the flooding around Houston Tuesday. It appears depsite all the work done on the drainage system we will still have widespread flooding in the city. Realistic or not – what do you propose the city do about it? The Insite would like to hear your opinion on this issue! CONGRESSMAN GENE GREEN IS BRINGING SOME GREEN TO TEXAS! Posted in Uncategorized | Comments Off on CONGRESSMAN GENE GREEN IS BRINGING SOME GREEN TO TEXAS! PART OF THE ECONOMIC RECOVERY PACKAGE! Representative Gene Green today announced that almost $300 million in civil works project funding would be sent to the Galveston District Army Corps of Engineers, including $123.9 million for the Port of Houston. Congress passed an economic recovery and stimulus package, the American Recovery and Reinvestment Act (ARRA), and it was signed into law by President Obama on February 17th. ARRA was an investment in the workforce designed not only to rebuild America and protect jobs, but also to transform the economy for long-term growth and make Americans globally competitive. In early March 2009, Green was joined by Representatives Olson, Culberson, A. Green, Poe, Jackson Lee, Brady, McCaul, Paul, Carter, Edwards, and Rodriguez, in sending a bipartisan letter asking the U.S. Army Corps of Engineers to fund $103.47 million in shovel-ready projects for the Port of Houston. As the largest U.S. port in foreign commerce, the Port of Houston is responsible for 785,000 direct and indirect jobs and $117.6 billion in economic impact. $300,000 – Grass Plantings at Bolivar Marsh. $500,000 – Complete Dredge Material Management Plan for Galveston Ship Channel. Provides a more efficient, least costly, environmentally acceptable disposal plan. $500,000 – Atkinson Island Grass Planting. $25.1 million – Phase II contract to dredge Galveston Channel to authorized project depth. Completes project. $25.4 million – Rehabilitate and enlarge Mid Bay Placement Area creating 200 acres of wetland marshes, and reducing future maintenance costs. $35.4 million – Rehabilitate Placement Areas 14 & 15 to increase dredged material placement capacity and reduce future maintenance costs. $600,000 – Contract to complete feasibility study for assumption of maintenance on Jacinto Port Channel and expanded portion of Bayport Channel to reduce future maintenance costs. $36.1 million – Construction contract to rehabilitate Spilman, Lost Lake, and Peggy Lake Placement Areas. Reduces future maintenance costs. FORMER PRESIDENT BUSH 41 NEEDS YOUR SUPPORT! 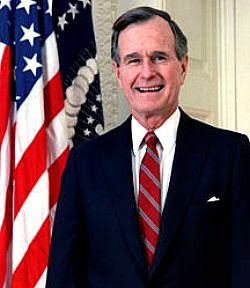 Posted in Uncategorized | Comments Off on FORMER PRESIDENT BUSH 41 NEEDS YOUR SUPPORT! WILL YOU ROLL UP YOUR SLEEVE AND HELP YOUR COMMUNITY? Standing at “ground zero” where Hurricane Ike raged ashore last fall and cut a path of destruction that made it one of the costliest storms in American history, former President George Bush predicted the residents of Texas’ Bolivar peninsula will write one of the greatest comeback stories in the state’s colorful history before helping to clean a beach and asking concerned citizens to consider making a financial donation at www.bushclintoncoastalfund.org. President Bush, who presently cites his age at “84 and 7/8s,” was joined by former Secretary of States James A. Baker, III and Texas General Land Commissioner Jerry Patterson to help kick off the 23rd annual Adopt-a-Beach Spring Cleanup program organized by Patterson’s office in conjunction with Volunteer Houston, the Points of Light Institute, and lead corporate sponsor Shell/Motiva. Hurricane Ike his the Texas and Louisiana Gulf Coast in September of 2008 and caused an estimated $27 billion in damage. Official counts and media reports indicate that 20 people died in Texas, Louisiana and Arkansas as a direct result of Ike, and more than 100 indirectly. More than 30 remain missing from Galveston County alone as of April 2009. Some 3,600 homes were destroyed – leaving nothing but a concrete slab or pilings – on unincorporated Bolivar Peninsula, devastating the communities of Port Bolivar, Crystal Beach and High Island and wiping the town of Gilchrist and its approximately 300 homes off the map. 5 The bill for debris cleanup for unincorporated Galveston County alone has topped $60 million. All four fire departments on the Peninsula were gutted by the surge and winds, and, seven months after the storm, only the departments in Port Bolivar and High Island are functioning. Galveston County and FEMA are spending nearly $200,000 a month providing temporary fire and emergency medical service to protect the Peninsula’s remaining structures and homeowners determined to rebuild. The Bush-Clinton Recovery Fund, which is a donor-directed 501 (c)(3) fund, marks the third time George Bush and Bill Clinton have led a joint disaster recovery effort bearing their names. In 2005, the two leaders help address Indian Ocean tsunami and Hurricane Katrina recovery efforts. This new Bush-Clinton hurricane recovery fund will not be making grants to individuals or families, but will instead coordinate closely with the hardest hit cities, towns and municipalities along the Texas and Louisiana Gulf Coast to identify and fund those infrastructure projects that make the biggest difference in the lives of local citizens (such as rebuilding schools, libraries, hospitals, etc.). 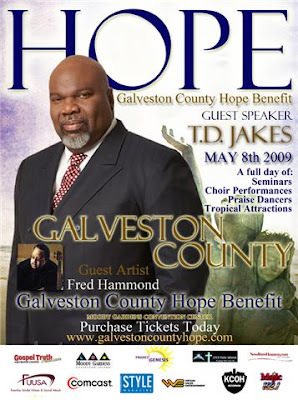 LOOK WHO’S COMING TO THE HOUSTON AREA (GALVESTON COUNTY) NEXT MONTH! Posted in Uncategorized | Comments Off on LOOK WHO’S COMING TO THE HOUSTON AREA (GALVESTON COUNTY) NEXT MONTH! WILL YOU GO AND HEAR THE WORD OF T.D. JAKES? HPD SAYS DESPITE THE BAD ECONOMY CRIME IS DOWN! Posted in Uncategorized | Comments Off on HPD SAYS DESPITE THE BAD ECONOMY CRIME IS DOWN! WHY DO YOU THINK CRIME IS DOWN IN HOUSTON? In response to the economic recession, the nation has experienced an increase in crime. In Houston, however the violent crime figures have significantly decreased, while the non-violent crime rate is virtually unchanged with a 1% increase. 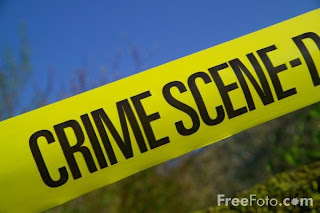 Uniformed Crime Reports (UCR) show in FY 2007- 2008 (July –March) Total Part 1 Crimes were down only about 1% in comparison to the same nine month period of FY 2008 – FY 2009 which reveals a decrease of almost 7% in violent crimes in Houston. UCR crime stats further indicate that an examination of the first three months of 2009 (January-March) compared to the same period of 2008, violent crimes have declined by 8% in Houston. More importantly, the murder rate has dropped significantly by almost 22% from January – April 27, 2009, compared to the same period of 2008. Additionally, as of March 2009, gang murders were down 47% from the same time period one year ago. UCR defines violent crime as murders, rapes, robbery and aggravated assault, while non-violent crimes are identified as property crimes, burglary and auto theft. Crime Stoppers of Houston will pay up to $5,000 for information leading to the arrest and charging of any felony suspect. All callers will remain anonymous. Crime Stoppers can be reached at 713-222-TIPS (8477). “Houston’s crime rate is at one of its lowest points in over two decades,” says Chief Hurtt. Chief Hurtt’s comments are based on figures from UCR’s Part One, Total All Crime Comparison of the City of Houston from 1980 – 2008, as evidenced by the chart below. SHOULD THE U.S. CLOSE THE BORDERS DOWN SOUTH? Posted in Uncategorized | Comments Off on SHOULD THE U.S. CLOSE THE BORDERS DOWN SOUTH? US OFFICIALS SAY NO – WHAT DO YOU SAY? At last check, Mexico had 149 suspected deaths from the swine flu. Here in the U.S., dozens of victims have all survived, 11 cases so far in California, five of them in San Diego, and 3 in Texas. Now the focus is on the border, and how to stop the spread of this virus. Do you think the federal government should seriously consider closing US borders until the illness is contained? The Insite would like to hear your opinion on this issue. So far US officials say keep the borders open!